We just returned from a short vacation in Udaipur in Rajasthan. 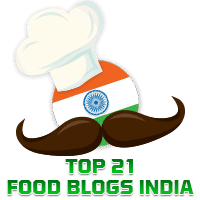 We had the famous Rajasthani kadhi there and I wanted to try it out for myself. 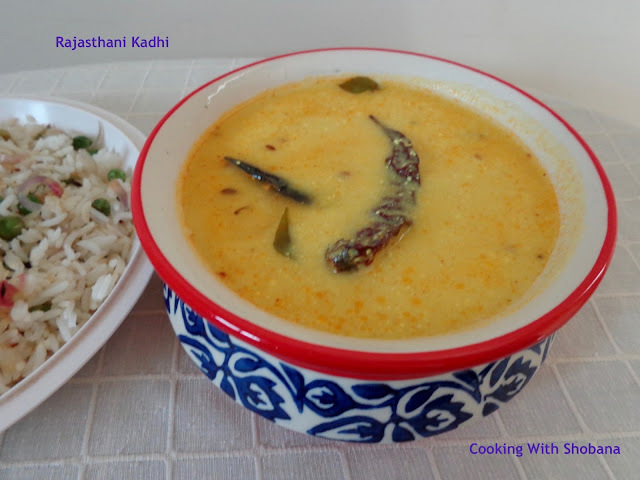 The kadhi is a versatile curd/yogurt based dish made with besan (Bengal Gram Flour) and spices. I am of course used to the Gujarati Kadhi whose recipe you will find elsewhere in this blog. Today's recipe has been adapted from Rajasthani Pakoda Kadhi by the famous cookery expert, Tarlaji Dalal. I didn't make pakodas since they need to be deep fried. Instead I made just the kadhi which we enjoyed with peas pulao. The curds/yogurt used for this dish should preferably be slightly sour rather than sweet. In a large bowl, using a whisk combine together the curds, besan, turmeric powder, and salt with 2 and 1/2 cups of water to form a mixture. Make sure they are well combined and the besan does not form lumps. Keep aside. Heat oil in a deep non-stick pan, on medium heat add the cinnamon, followed by cloves, red chillies, fennel seeds, coriander seeds, cumin seeds, fenugreek seeds, grated ginger, curry leaves and lastly the chilli powder. Saute for a few seconds making sure the spices don't get burnt. To this add the mixture of curds and besan prepared earlier. Mix well and cook on medium flame for about 5- 8 minutes stirring from time to time. It is essential that you stir from time to time to avoid the kadhi getting burnt at the bottom.